Planning U-turn frees up space for cars | What Car? 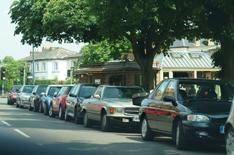 Essex County Council has challenged Government guidelines by publishing new planning proposals that provide more space for cars. The council says the changes will 'remove the blight of parked cars' and hopes that other councils will follow suit. Proposed new parking standards which cover residential and commercial parking include bigger garages, more off-street parking and longer driveways, along with larger parking bays to take into account the increase in size of cars. A study by the council suggested that many garages are too small for modern cars and that 78% were not used to store vehicles. It also reported that the existing minimum legal requirement for parking spaces led to more cars being parked on the street, restricting access for cyclists and buses. Councillor Norman Hume, Essex County Council cabinet member, said: 'This new parking guidance is a radical break from the previous failed approach, which has seen local communities blighted by parked cars.